IPCPR 2017: Where Are The New Cigars? Elie Bleu's limited-edition humidor has a gun on top and matching obsidian ashtray. The silencer on the ashtray gun's barrel actually detaches from the body so you have a handy, portable cigar rest. Last week, the bulk of the premium cigar industry gathered in Las Vegas for the 85th annual International Premium Cigars and Pipe Retailers trade show. Normally, the show provides a venue for premium cigar manufacturers to show off their newest smokes so that retailers can get a chance to sample and purchase what will be shipped to cigar shops throughout the country later in the year. It's become commonplace for cigarmakers to send out information about what they plan to bring to the show in advance of the actual IPCPR dates. The idea is to drum up intrigue and excitement for the new products to come—Marketing 101. In year's past, though, many cigarmakers have kept at least a few special cigars secret, revealing them only at the show. At Cigar Aficionado, we split up coverage of the manufacturers so that each editor gets an opportunity to sit and talk with makers in depth about their new cigars. Therefore I didn't talk to every manufacturer, but the team covers everyone. With the companies I was tasked to cover, 25 in total, far too often I heard the same answer to my question of what do you have that's new, and that answer was "Nothing." Something was off about this year, and while I walked the show floor on the first morning, one question kept coming to my mind: Where are the new cigars? Many cigarmakers told me the reason is simple: FDA regulations. A lot of small- to mid-size companies are in a holding pattern, waiting for some sort of decision to be made regarding whether or not the FDA's draconian laws concerning premium cigars will be upheld, or (hopefully) eliminated. In other words, we are seeing the strict Final Rule that the FDA published last year is already affecting the industry in that it's restricting premium cigar manufacturers creativity. It wasn't all doom and gloom at the show, but there was a significant decrease in the amount of new SKUs being shown. And who can blame manufacturers? While no one knows for certain, the cost of getting a single new SKU could run into the tens of thousands of dollars. So rather than bring completely new brands to market, many makers I met with are opting only to add a new size or two to existing lines. At the end of the day, while manufacturers are handcuffed by the FDA, it's the consumers, the men and women who enjoy premium cigars, who lose in this situation. One new smoke that no one knew was coming was La Opulencia from My Father Cigars. This new brand was kept so close to the Garcia family's chests that their own sales team didn't even know about it until the morning of the show. A true reveal! The smoke is damn strong, thanks in part to a Mexican wrapper. And all the binder and filler tobaccos hail from the Garcia's farms in Nicaragua. Manufacturers have always made smaller versions of their more popular brands. Rocky Patel has his Juniors, J. Fuego has his Origens, Macanudo Minis are a big seller and Pete Johnson offers five-packs of some of his lines under L'Atelier, just to name a few. This year, though, it seemed like the format has been given a more prominent spot in a lot of booths. One maker said it's because smokers want something they can quickly enjoy, which makes sense. To get a sense that smaller may be trending, Drew Estate has joined the game and will begin to sell 10-count tins of cigars that measure 4 inches by 32 ring gauge in some of its most popular premium brands, including Herrera Esteli, Undercrown Shade, and even Liga Privada. While new cigars may have been hard to come by at this year's show, a plethora of cigar accessories were on hand. Most notably, Colibri has come out with a slew of new cutters and lighters that are both well designed and feel great in one's hands. One cutter in particular, the Quasar SV Cut, is a small cube that is meant to be a tabletop cutter. It offers smokers two choices for cutting their cigars: a standard double guillotine and a v-cut. Not to be outdone was Elie Bleu, who came to the show with a bunch of new humidors that showed off the company's exceptional marquetry and attention to detail. 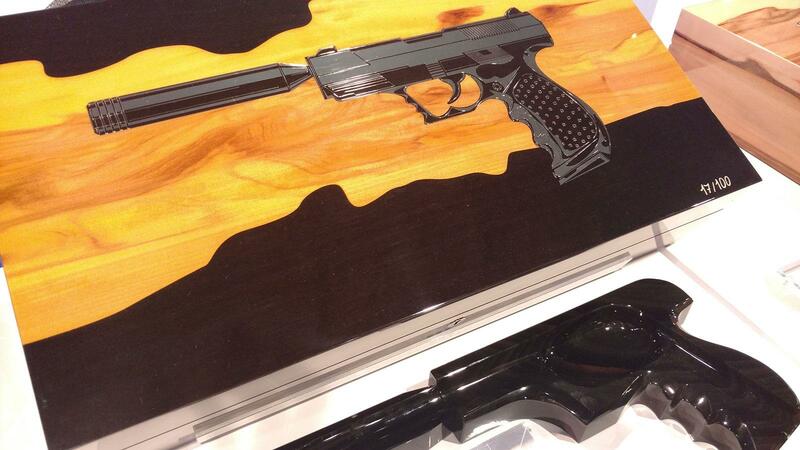 One that stood out was a limited-edition humidor that has a gun on top and matching obsidian ashtray. The silencer on the ashtray gun's barrel actually detaches from the body so you have a handy, portable cigar rest. Legendary Boston Red Sox slugger David Ortiz made an appearance at the show. I've been a huge fan of the Sox ever since I was old enough to watch the games on NESN, and so it was an honor to meet the man better known as Big Papi. He's partnered up with Tabacalera El Artista to create a new brand called, you guessed it, Big Papi. The Dominican-made cigar smokes well, and Ortiz said he likes to pair it with Scotch and also his wine brand, Arias.